Anyhoo, this past week I celebrated two birthdays with two of my closest friends. One turned 50, and is none too thrilled about this milestone. And the other turned 58. Here’s the thing BOTH are freaking drop dead gorgeous, have bodies that twenty-somethings would be jealous to have and have done very well with their careers. That said, it still is crazy to think about how quickly time flies and how weird it is to be fifty-anything. Believe me, I know. Gluten-free birthday cake. So, so good. I guess what I’m trying to say is that after spending time *twice* this week with these ladies, I realize how lucky I am in the friend department. I also realize that I need to up my game and be a better friend. Let’s take Jen, for example, she is the one one who calls ME every couple of weeks just to say hello when she’s on her way to work. 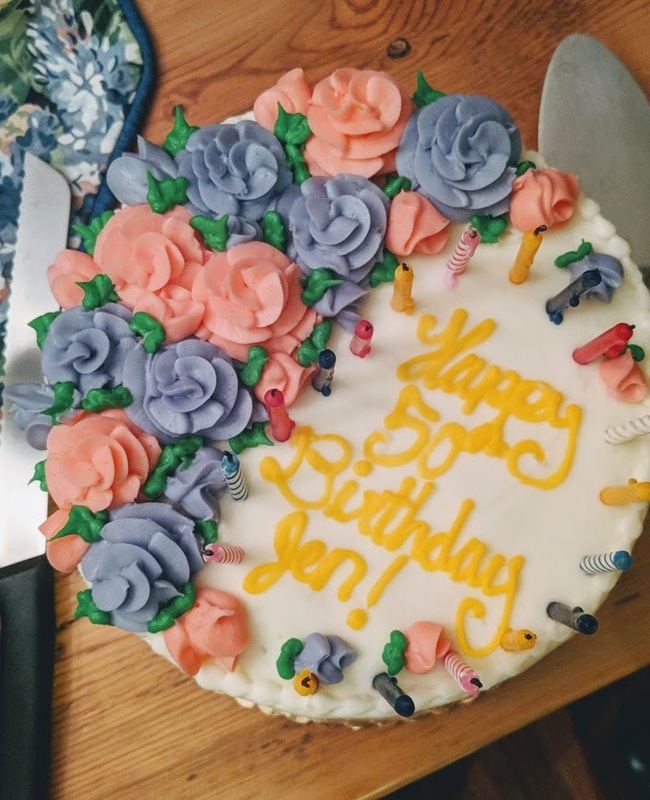 And, Kelly, my other friend who celebrated a birthday this week ALWAYS makes sure that I have a terrific birthday and makes sure I’m included in every fun thing she’s doing – even if it’s something I’ll probably say no to (like yoga or taking a 20-mile bike trip). So, in addition to this being the year of creativity, I am also dubbing this the year of being a better friend. Speaking of getting creative, here’s an update on what I’ve done so far this year. I dusted off the sewing machine and made this fun top. A few mistakes, but am wearing this simple black, wide rib knit pullover with pride. It’s McCalls Pattern 6964. I made the 3/4 length crew neck. First time working with knit fabric in YEARS but am generally pleased with how this turned out. I’ve also been having some fun learning how to modify patterns so that they fit and have spent the last two weekends making a muslin for the Colette Sorbetto top with these awesome instructions in this sewalong. By the way the pattern is FREE. I cut it out and will be making that *hopefully* later this week . . . so stay tuned!